Teaching children how to play a sport is an effective tool that can not only teach the fundamentals of the game, but can also instill discipline, work ethic, and several other skills that can be used in everyday life. While playing basketball is a fun activity for kids of any age, there are many who play in an organized league where competition is at the forefront. We've pulled a wealth of tips and strategies for coaches coaching in youth basketball tournaments. A lot of this may appear to be common sense, but is worth stating. The sole focus of these dos and don'ts is that the coach is the one who is a role model and should always act in a positive light. Below are some general tournament dos and don'ts. The coach has the biggest influence on how players will act during the games - stay positive and always be respectful! Allow players to simply go through the motions. Instead, you should bench them if they aren't giving 100%. Rather you are coaching youth basketball tournaments or not, it is necessary to recognize and establish what is most important about this particular type of coaching: the kids. While it is always nice to win, the main objective should be placed on the fact that the kids are having fun while exercising. Additionally, kids should get a sense of success through building confidence and skills. These two aspects of coaching should be done using a pressure-free approach. When coaching in tournaments, it is important to have access to a variety of tips and strategies. Read through these tips and apply them at your next tournament. The first piece of strategic advice is to give your team depth on the bench. By swapping out players more often, you will prevent your best athletes from getting injured or too tired as they move from game to game. This will also give you a wide variety of substitution combinations. Speaking of getting too tired, it's a good idea to incorporate some conditioning in the practices leading up to a tournament. Even light conditioning can help your players get used to playing when they're not fresh by making them stronger. Before the tournament, you will want to establish a strict and structured practice and game day routine. This will keep everyone organized throughout the tournament. Motivating younger athletes is a lot different than motivating an adult athlete. Instead of using the common methods of motivating players, speeches will need to be shortened to around 2 minutes or so. Try sandwiching your critiques between complements. For example, you can say to your player, "Great job out there on the court! Next time try passing a bit sooner. Keep hustling out there and you guys will make some more great shots." This is a positive way to coach younger kids who might get discouraged when they aren't doing well. These methods can be used to encourage players. And of course don't forget about awarding a high-five or fist pound for those who are really "on point." As previously mentioned, kids should be enjoying themselves at practice and games. Basketball, (even when competitive) should be all about fun. As a result, a fun way to keep kids interested during basketball practice to prepare for tournaments is to incorporate some fun drills in between regular drills. There are lots of great basketball games you can play at practice that focus on specific skills. Check out this list of basketball games for kids that you can test out. No matter what type of drills that are practiced when getting ready for youth basketball tournaments, coaches tend to stick to the fundamentals of the game. This is a great idea. These fundamentals are the mere basics of the game and include things such as shooting skills, lay-ups, dribbling, ball handling, and things of that nature. Here are some great basic drills to help your players get the fundamentals down. By going back to the fundamentals of the game, even if the players already know them, the team will be better both offensively and defensively. First and foremost, have fun. It cannot be said enough. Secondly, concentrate on the moment. You don't want to be distracted by thoughts about last practice or what you are going to do that night. Additionally, you want your players to focus on what they are supposed to do individually to help the team succeed. Finally, don't focus on things that cannot be controlled - they are irrelevant in game situations. In conclusion, coaching kids is an incredibly rewarding experience, and you can help your team shine at tournaments. 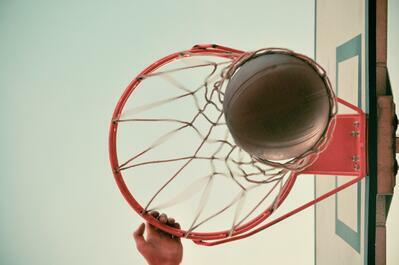 Use these basketball tournament tips to keep you and your team positive, motivated, and inspired! Good luck!